There was just so much going on this weekend, that it’s hard to get it all written down. Especially on a short week. Many games across Pennsylvania and New York were postponed. Altoona went from hosting two games to hosting six games. District 9 couldn’t find anyone to host their games. Bradford was to host the 1A championship, while DuBois was to host the 2A championship. And Clarion was going to host Clearfield-Cathedral Prep. But the weather undid all those plans. Slippery Rock University suddenly were the hosts of the 4A matchup. While the 1A and 2A games remained in limbo throughout Friday and into Saturday. But, on Friday, District 7, aka the WPIAL, had two semifinals scheduled in 2A and 5A. Of the eight teams, I only had Peters Twp as a new team for me. But, the game was scheduled for Norwin. And my original plan was to just drive over to Slippery Rock for the Friday night contest. But, there also was a game between West Allegheny and Gateway at West Mifflin. Norwin and West Mifflin were both places I hadn’t seen a game before. So, I decided West Mifflin would be it. It would also by my 900th high school varsity game of all-time. After a scoreless first quarter, the Indians and Gators traded touchdowns, going into the half tied. And in the third quarter, traded four more touchdowns to setup an epic clash in the final frame. West Allegheny took the lead on a 27-yard TD pass on 4th and 2. Gets an interception, and then scores on a 4th and 1 on a 24 yard run. Sending coach Bob Palko to another WPIAL Championship Game in his final season. They face Penn Hills, who beat Peters Twp, for the 5A Championship. That game is at Norwin next week. The next day was another drive south. This time to Heinz Field for four WPIAL/District 7 Championship games. 1A, 3A, 4A, and 6A over the course of the day starting at 11am. Their scheduled proved optimistic. After the game, tragedy struck as I broke my camera lens. So, had to resort to my backup. Not as good, but it did its job. Quips jumped out to a 22-0 lead after the first. And led, 30-6 at the half. Wasn’t much excitement in the second half as it was clear Aliquippa was going to hang on to the victory. Even a late touchdown to make the score a little bit more respectable couldn’t help. After that it was a bit of a break for the third game. South Fayette playing underdog to Thomas Jefferson’s favorites. Again, scoreless, through the first quarter gave way to 31 points before half, as Thomas Jefferson scored three touchdowns to take the lead, 21-10 at the break. Third quarter was all South Fayette, as they scored three touchdowns and TJ could only muster a single field goal to head into the final frame, trailing 31-24. And the Lions would hang on for the 31-24 victory. The night cap would kickoff over an hour after originally scheduled. A matchup between overwhelming favorite, Pine-Richland, against surprise participant, Seneca Valley. The Raiders punched their ticket to Heinz with a victory over North Allegheny. Denying a rematch of one of the better 6A matchups of the regular season. After another scoreless first quarter, the third of the day, Pine-Richland scored with 5:22 left before the break. On a 29-yard TD pass after an interception. The Rams dominated the third frame, taking a 27-0 lead thanks to three touchdowns and two extra points, before the teams traded touchdowns in the fourth. Pine-Richland advanced easily, in a matchup against State College next week in Altoona. By this point, three games were moved to Sunday to be played in Altoona. And District 9 finally settled on a host site for their two championship games. Karns City would host on Monday afternoon as a doubleheader. After passing up the opportunity for two, or even all three, game on Sunday, it was on for the doubleheader at Karns City. A rainy, cold afternoon. A long drive, thanks to a lot of slow traffic, got me to the game just as kickoff was happening just minutes before the advertised start time. The two teams traded touchdowns to start the game. And Coudersport added another touchdown to close out the first frame, 14-7. But then the floodgates opened. 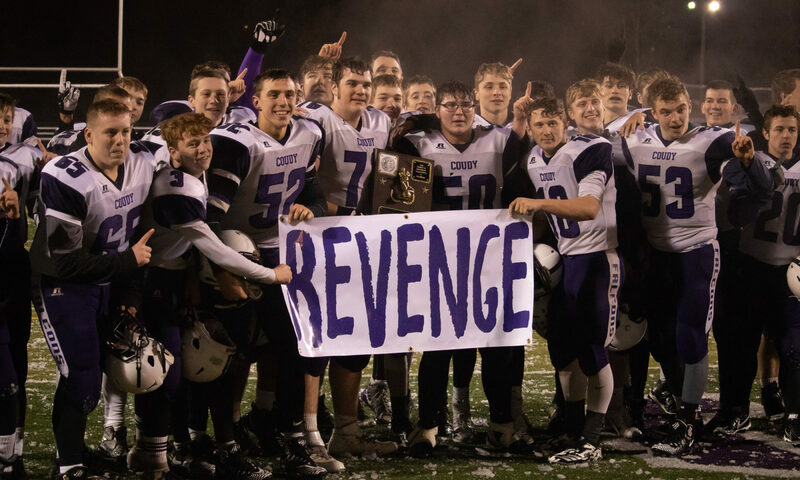 Turnover after turnover gave the Coudersport Falcons a huge advantage. And a lot of touchdowns. Soon, that 14-7 lead ballooned to 36-7 at the half. Coudersport opened with a 58-yard TD run to set the mercy rule into motion, leading 44-7. With the early fnish of the first game, the 7:30 kickoff of the second game was a bit of a wait. Nearly 90 minutes between games. Very few seemed to stick around for both. A long drive for the quite impressive 1A crowd meant little hanging around. And very few seemed to have shown up early for the second game. In contrast to the first game, scoring was at a premium, and penalties were a dime-a-dozen. Another game this weekend ended with a scoreless first quarter. But, Brockway opened it up late in the half to take a 7-0 lead. A lead they’d hold going into the final frame. …and the boy’s basketball championship. Turns out, with the game getting bumped around, the correct championship plaque was left at DuBois. So, a stand-in was used for the presentation. As a reward for their tireless effort to host the two games, Karns City was rewarded with another hosting duty next weekend. The 2A championship between Wilmington and Ridgway/Johnsonburg will take place right back at Diehl Stadium on Saturday at 1pm. Elsewhere of note, the Ohio playoffs are now in their semifinal round. The titles will be played the next week at Canton’s Tom Benson Hall of Fame Stadium. Tennessee, also, is to their semifinal round for Division I classes. Division II classes have already conducted theirs, and is just waiting until the following weekend for their three state championship games. Also, for next weekend, a team I saw earlier this year will be playing for the Indiana state championship. Marion Eastbrook played at Ball State earlier this year. They play for the 2A Championship against Western Boone on Friday afternoon. And New York’s state titles start Friday. All five New York state championship are played at Syracuse University’s Carrier Dome. Usually, you’ll see the games split between Friday and Sunday. But, this year they’re played on back-to-back days. Of the ten teams playing, I’ve seen four of them. Clymer/Sherman/Panama, I’ve seen earlier this season twice. Once in Panama, and the Section 6 championships at New Era Field. Clymer is located just a few miles north of Corry, Pennsylvania. The Clymer district encompasses the furthest southwestern corner of the Empire State. Also, Cornwall Central, Batavia, and West Seneca East–another team from earlier this year–are on my list.